As you already know a SIMD registers can communicate with the scalar domain (or more precisely with the memory) using LOAD and STORE operations. The drawback of these operations is that they only allow you to move data elements, that are placed contiguously in the memory. However very often in our codes we have to deal with non-contiguous memory access. In this tutorial we will explain GATHER/SCATTER operations and how they generalize LOAD/STORE operations. We will discuss first two situations in this post. The last class of problems needs more thorough discussion in the context of permutations, so we will discuss it in the next tutorial. What then is a SCATTER operation? It is simply a reverse of a GATHER operation, which ‘scatters’ the content of a register over the memory. It is therefore similar to STORE operation, but capable of non-congiguous memory access. 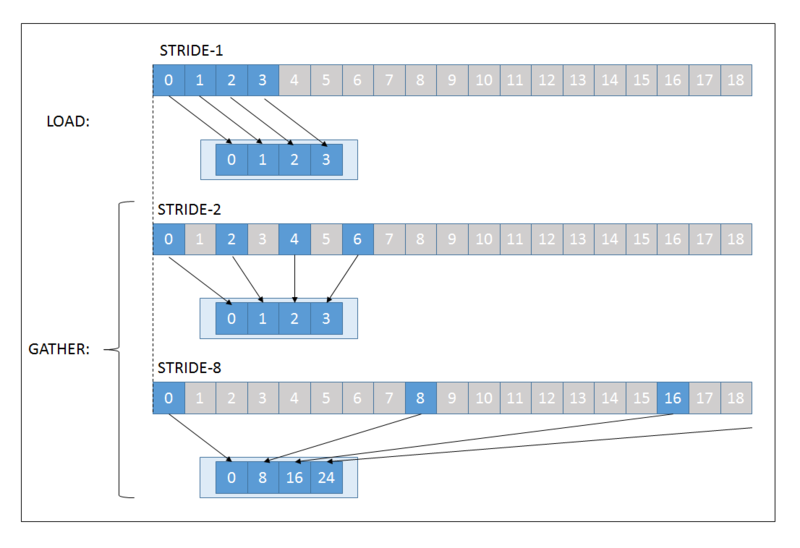 As you can see, the STRIDE-1 access is a special case of GATHER operation: a LOAD operation. Why then do we have separate LOAD and GATHER operations (and STORE and SCATTER) instead just simplifying things and using only GATHERs? There are two explanations. Firstly, there is the historical one: early processors only implemented LOAD instructions to move data between memory and scalar registers. Since in scalar domain you can access any element using a single scalar index, there was no need for more flexible operations. Secondly, there is the performance aspect: apart from passing the base memory address, the gather instruction requires also information about how to calculate specific offsets to load from. No matter how the instruction is implemented within the processor, this is an additional degree of freedom, possibly meaning longer execution time, but for sure meaning additional circuitry. PERFORMANCE HINT Use load/store operations whenever you can, and avoid gather/scatter if possible. In most scenarios this will mean that your data structures/algorithm have to be modified. Use gather/scatter only when you are certain, that re-designing structures is not possible. When performing a strided access you need to know what are the base address, passed as a pointer to the beginning of your data, and the stride value, passed as a scalar integer. The stride is always passed as the number of elements, rarther than memory offset so that the programming can be simplified. // Note that we have to scale the loop index. // 'load' the data to vec. When using strided access, we have to pass the address of the first element. This is done by calculation offset variable in every iteration. The gather operation then uses this local base address together with a scalar stride to calculate offsets of the corresponding elements. Once the necessary calculations are over, the updated results are stored back at original locations. The adventage of this mode is, that every element can be retrieved using a dedicated index. Disadvantage is that the indexing this way might completely destroy hardware based memory prefetching, and in turn negatively impact your performance. Also mind that all elements might be far away, meaning that more cachelines have to be moved to the lowest cache level. // but they can be computed on-the-fly if necessary. The basic difference is that instead of passing a scalar stride we will use an unsigned integer vector of 32b indices. // values in (a[i],b[i]) pair is not determined properly. // of the values in (a[i],b[i]) pair is not determined properly. temp.gather(&c, indices); // This is WRONG!!! temp.scatter(&c, indices); // Again WRONG!!! temp.gather(condition, &c, indices); // Now the read is CORRECT!!! temp.scatter(condition, &c, indices); // Again no problems here. So in the corrected version we have to simply pass an additional mask parameter to memory access operations, rather to arithmetic operations. The library will take care of securing the reads so that they access only allowed memory addresses. 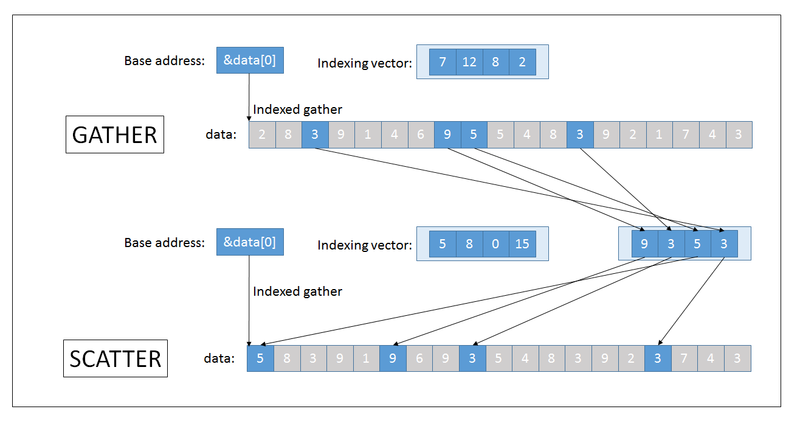 In this tutorial we introduced concept of GATHER/SCATTER operations, and explained why they are a useful addition to our SIMD programming model. We looked at both strided and indexed memory access patterns, and explained how this concept generalizes LOAD/STORE operations. While very usefull, GATHER/SCATTER operations are a double-edged sword that can both make our lives easier, and destroy our performance. In the next tutorial we will talk about permutations. There we will discuss also the GATHER/SCATTER as one of possible strategies for re-arranging vector elements.